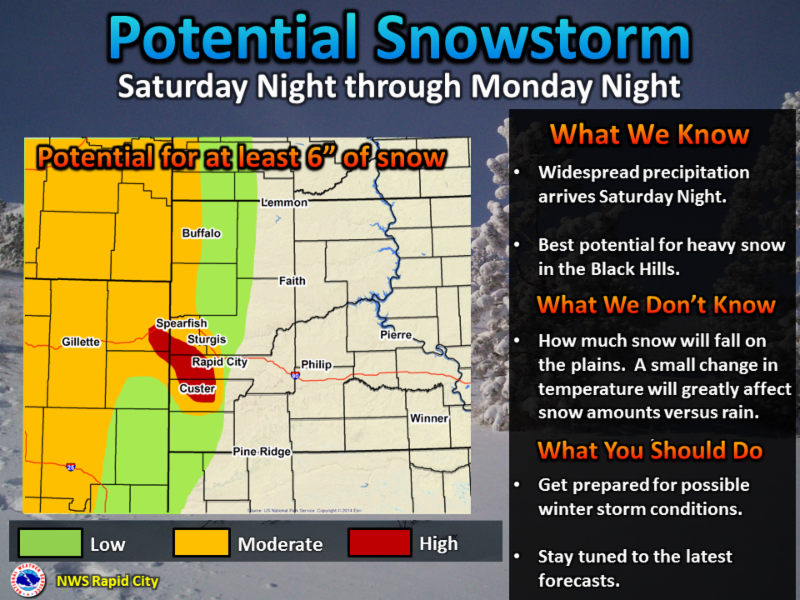 Confidence has increased enough for us to issue a Winter Storm Watch for the Black Hills, where 6 inches or more of snow is possible late Saturday through Monday. While some accumulating snow is looking likely on the plains of Northeast Wyoming into Northwest South Dakota, confidence remains too low at this time to issue any winter weather type headlines. Also keep in mind that this storm will affect the area over a period of nearly 48 hours. Even where snow does not fall, widespread cold rain will. This long duration of cold rain could have impacts on livestock. We’ve attached an image highlighting our current confidence levels for significant snow across the region. If you have questions or need more information, you can call us 24 hours a day at 605-341-7435 or 1- 800-684-4163 or send an emai l message to nws.rapidcity@noaa.gov.